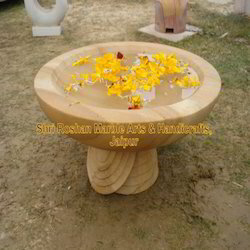 Prominent & Leading Manufacturer from Jaipur, we offer decorative stone bowls. Our firm is recognized as the prominent manufacturer, exporter, wholesaler, trader, retailer and supplier of Decorative Stone Bowls. The given stone bowl is intricately crafted by our innovative craftsmen by making use of best quality stone & it’s shaping tools in compliance with the market trends. Offered stone bowl can be customized as per the specific needs of customers in a given time frame. Customers can easily avail this stone bowl from us at affordable rates. Looking for Decorative Stone Bowls ?